It was a short night last night. Rob and I were up late celebrating Obama’s victory (or Who-bama, as Little Mr. E calls him). In my concept of a perfect world, the Green Party candidate (Cynthia McKinney) would have won, but in the real world, this is a dream come true. After listening to President Obama's victory speech I was exhausted, but I was too wound up to sleep. It didn’t help matters any when the alarm went off at 4:40am this morning. Rob had some kind of conference in Chicago today, and he had to be there by 8. Left on my own for dinner tonight, I made my new favorite thing. A while ago, I found a really fabulous recipe for greens on an amazing website called Vegan-A-Go-Go, and I just can’t get enough of it. I made these greens to go with dinner a few days ago, and even though Rob ate it, he did not share my enthusiasm. “They’re okay, I guess,” is what he said. So even though its a bit lonely with Rob not here for dinner, I contented myself by having a Green Party. The first time I made this dish, I used kale and spinach. 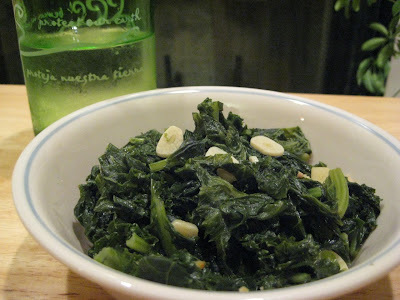 This time, I used kale and mustard greens, and I think I liked my first batch better. But seriously, this is good stuff. This is an answer to the horrified question: "You're a vegan? What do you eat?!" Rob was driving through Kankakee about an hour ago, so he should be home any minute. And I’ve got to go, to see Jon Stewart’s take on the election. If only they could rescue the tons of discarded cooked spinach from middle school lunch rooms across the country.